2. I am a decorated Navy veteran of Operation Desert Storm. My first three memorable acts as a Navy engineer officer — accidentally insulting the officers’ wives club of USS Blue Ridge (LCC-19), refusing to dance with the admiral’s wife and blowing off the captain’s barbecue to go bike riding. I like to think I’ve matured a little since then. 4. 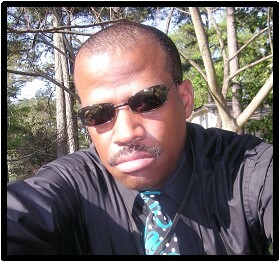 2011 is the 30th anniversary of my becoming a professional journalist. In September of 1981, I joined the high school newspaper staff of the Medford High School Mustang where I was assigned to cover the Afro-American Club (that’s Afro­-American), the French Club and DECA. I also began writing an occasional column on high school news for the Medford Mercury, the city newspaper. 5. 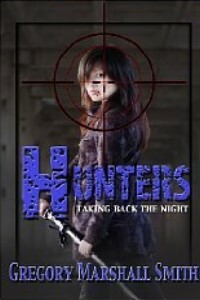 Although Hunters is my first full-length novel, it is not my first published piece of fiction. That honor goes, ironically, to a cheesy comedy short I wrote called “The Brown Cougar” for a local community newsletter. It was a clear rip-off of The Pink Panther and the less said about that, the better. Probably the saddest part of my long writing career is the fact that most of my earlier work is lost or sitting in some ancient archive somewhere. Much of the high school news work wasn’t archived and the items for the professional newspapers (Mercury, Mid-Cities Daily News) are dank basements on old microfiche. Some are even somewhere in Tokyo, Japan in the files of a now-defunct magazine. 6. When I’m not writing science fiction or horror, I write freelance sports, covering historically black colleges and universities. I am giving away two free ebooks of Hunters. To enter, just drop a comment or two (but no f-bombs) to one of the e-mail addresses above. Be sure to include a return e-mail address to be considered. I look forward to hearing from you all. This entry was posted in Blog, Books, Contemporary Fiction, Feedback, Guest Blogger, Horror, Paranormal, Tour and tagged About, Blog, Blogger, Books, Contemporary Fiction, Facts, Fantasy, Fun, Fun Facts About Gregory Marshall Smith, Gregory, Gregory Marshall Smith, Guest, Guest Blogger, Horror, Hunters, Marshall, Paranormal, Smith, Tour by LizzieBeth. Bookmark the permalink. Great Interview! Your book sounds amazing! I’d love to read it. gregory.marshall.smith@gmail.com). Make sure to include a return e-mail address so that you can be considered. He’s giving away two copies of his book to two lucky winners. Thanks for reading, Alexia. It’s just ready and waiting for you at Amazon.com, Barnes & Noble, Apple and Smashwords. Thanks for the interview. If there are so many top master vampires, I think they can own the night. I’m going to stay inside and get some sleep. By the way, do you think Gregory is willing to post his book on eTLC? As amusing as your first three memorable exploits were during that time period, I’d be remiss if I didn’t express my heartfelt gratitude for your years of sacrifice & service to the United States while serving in the Navy. LizzieBeth, you are such a wonderful person. I’m so grateful to you for all that you do & for the privilege of your friendship. I’m glad that you’ve enjoyed the interview. It was a pleasure having Gregory here on my blog. Hope to feature him again in the future. His writing is amazing. I want to thank everyone here for the great comments about my book and my “fun facts.” They are greatly appreciated and I look forward to stopping back in frequently.